Rugbytots is the World’s favourite rugby play programme, enabling boys and girls aged 2-7 to develop their social and physical skills in a fun, positive environment. Their classes, led by Jez Turner, take place at various locations in and around Doncaster including Cantley, Bessacarr & Epworth. 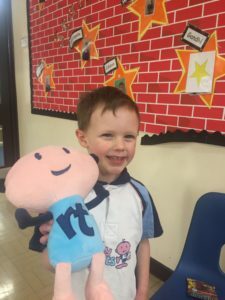 We’ve been doing Rugbytots sessions with my mini mumbler for about a year now, since he was three. I remember the first time that he attended a class, he looked very tiny and more than a little bit scared! I won’t lie, we had more than a few trips and falls in the first few weeks (thankfully it was indoors, so no scraped knees), but by the end of about the forth week my little one was beaming with pride after successful kicking a ball over the post. It wasn’t all about kicking though, it was about learning to pay attention, developing listening skills, balancing, throwing and catching. He loves the little assault courses where he has to jump over things, scramble under or through things. After getting his ‘kit’ for his 4th birthday and his own ball, he really got stuck in! 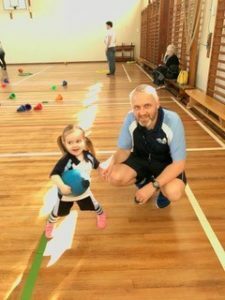 According to Jez, Rugbytots’ structured play sessions take children on a journey of sporting imagination, with engaging and energetic coaches supporting them every step of the way, whilst teaching how to catch, pass, kick, run with the ball and play as part of a team. A dad of three daughters himself (16,14 and 2) Jez set up Rugbytots in Doncaster after a long career working in an office for HSBC! Their motto is simple ‘make it more fun’. 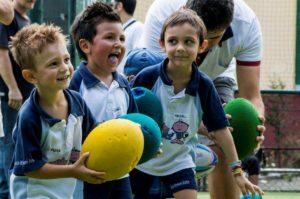 They do this by delivering their specifically designed programme for each age group with energy, enthusiasm and excitement. This creates an atmosphere in the class that is totally unique and engaging for parents and children alike. I can personally vouch for their patience too – we had a couple of incidents where we started the session with the ‘wrong colour ball’ (obviously this is very important when you are three or four). If we got any colour other than green, my son had a mini meltdown and refused to get off my knee. The coach quickly recognised this and started to give him a green ball at the start of each session, so we started the class with a smile. My daughter, 6, has also started Rugby Tots this term and she loves it too. It’s great to see her getting so much out of it. Rugbytots get’s a big thumbs up all round from us! We bought one of the rugby balls and some of the little ‘cups’ to practice balancing the ball on. This was worth it to see the huge smile on my little boys face when he mastered it. He looks very proud in class when he does this each week.